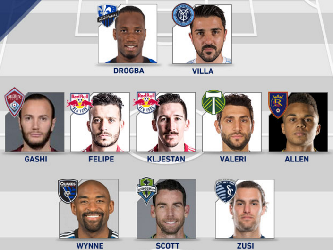 After registering a goal and a second assist for Real Salt Lake, Jordan Allen led RSL to a comeback win over Houston Dynamo after an early 1-0 deficit, and was named to the MLS Team of the Week for Week 9 of the season. Jordan has started in five of RSL's first eight MLS matches in 2016, and has received praise from several different sources for his recent performances (below). RSL are currently top of the Western Division standings and lead MLS in points per game at 2.13. See Jordan's goal and assist beginning at 1:45 in the OFFICIAL match highlight video below! After struggling to score for weeks, the New York Red Bulls have broken out over the past couple of weeks. On Friday, New York dropped four goals on league-leading FC Dallas as they collected their second-straight home win. Sacha Kljestan and Felipe led the way, registering a goal and an assist each, with Mike Grellachipping a goal of his own.